Stud Terminal Blocks are manufactured from brass, nickle plated brass, copper, steel, stainless steel, plastic base material or any composition as per custom specification. Stud Terminal Blocks are providing robust connection and sustainable safety in operation. Stud Terminal Blocks can be used with threaded studs for high strength contact. Stud Terminal Blocks are constructed with anti-corrosive nuts, washers and bolts. 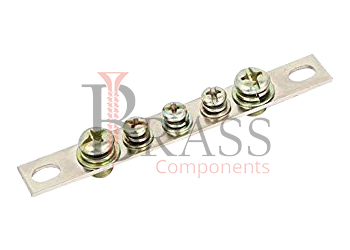 Stud Terminal Blocks are available with different type of coating and finish including Brass, Nickle Plated Brass, Chrome Plating, Zinc Plating and more as per custom specification and requirement. Feature a thermoplastic construction and mounting holes at each end. Mechanical vibration and shock resistance. Available with Robust and strong construction. Provide durable, reliable and high performance. Secure connections for all applications which entail a transmission of energy. Tighten the hex screw and provide complete installation. Stud Terminal Blocks are widely used for power and distribution circuits. Widely used in connection and distribution of power into installation. Widely used for high withstand voltage, high vibration and high insulation use. Ideal for used in harsh environments. Perfect for applications in vibration and shock resistance. Used for measuring, control and regulatory circuits with a clear functional advantage. We manufacture Stud Terminal Blocks as per Custom Specification and export in Finland, Jersey, Spain, Switzerland, Ukraine, Austria and other European Countries. For more Information, Please Contact Us or Inquiry Now.